Have you ever been really surprised by a recipe? Like, you thought it sounded interesting on paper, but didn’t really expect to like it? This was definitely one of those. I’ve had it bookmarked forever, but somehow the quantity of sugar threw me off. I couldn’t see myself going for this flavor combo, and was certain the results would be overwhelmingly sweet. But beggars can’t be choosers. And that’s how this dinner came about – from an empty fridge and rumbling tummies. I couldn’t have been more pleasantly surprised by how much we enjoyed this. It is sweet, no question. But the sugar does so much more than sweeten, it creates a glossy sauce with amazing depth. And it’s nicely balanced out by the spice from the chilies (which the original recipe says are optional, but I think they’re completely necessary to give this dimension. Just add as many as you think you can reasonably tolerate. For us, it was 4 dried red chilies.) And frankly, if you have people in your life who are suspicious of tofu (and I think we all do), this might be just the treatment you need to convince them. I added some green bell pepper to the basic recipe template because that’s pretty much what remained in my crisper that evening, but I can see this being delicious with a host of other vegetables. So add whatever strikes your fancy. There’s sauce to spare and it will coat everything in an incredible mix of sweet-spicy-salty. Add some cooked white or brown rice, and you’ve got a steaming, fragrant bowl of goodness. Our fourteen-month old completely devoured the leftovers for lunch the next day. And I’m pretty sure it wasn’t just for a sugar high. one side, about five minutes. 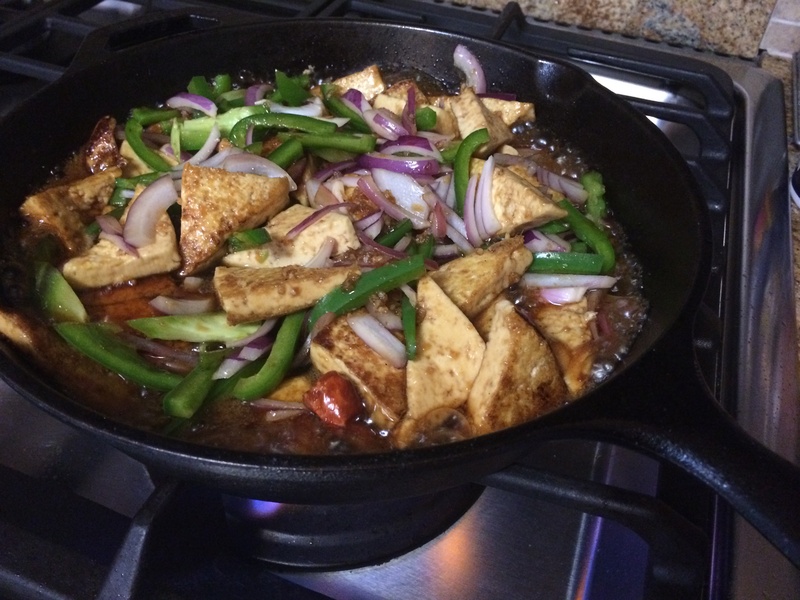 becomes a fairly thick glaze coating the tofu, about five minutes more. Serve immediately, topped with the scallions.